At American Patch, we love crafts – especially ones involved with thread or yarn. That’s where knitting and crocheting come in. Many people don’t know or don’t understand the difference between the two, so we’re here to enlighten you. 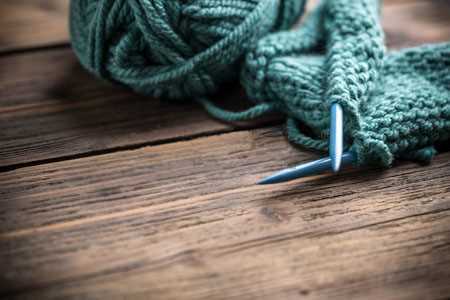 The term “knitting” comes from the Old English word “cynttan,” which means “to knot.” The act of knitting is done with two “needles,” which are rounded at the end, are several inches in length, and can vary in thickness. During the process, yarn is looped around one needle and the second needle is used to pull off the loops while adding another row of yarn. As the rows of loops (or “stitches”) stack together, they begin to create a thick, fabric-like textile. Knitting can be done in many different ways. There are a variety of stitch types, such as garter, stockinette, seed, rib, and more, and each type of stitch creates a different looking garment. In addition, different sized needles create different sized stitches, which makes for various looks. There are several different knitting styles that you can use to create a textile, from English to Continental to Western to Eastern. Which style you choose depends on which feels the most comfortable. The term “crochet” means “small hook” in French, and the process of crocheting is a bit different than knitting. Instead of using two needles, you only use one “hook” (which looks like a needle with a stubby hook on the end). Crochet hooks are often smaller and thinner than knitting needles. During the process, yarn is looped around the hook in a chain pattern, then the hook is used to loop yarn through each chain “link” and add another row of chains. As the chains stack together, they begin to create the end textile result. Like knitting, there are various crochet stitches that produce different results. For example, you could learn the puff stitch, the popcorn stitch, the afghan stitch, the drop stitch, and many more. Crochet hooks vary in thickness, which also changes the look of the textile. Because there is only one hook, there is really only one basic way to crochet and because of this, many people find it easier to do than knitting. While you can essentially knit or crochet any garment or article of clothing, there are some that are easier to knit and others that are easier to crochet. For example, sweaters, vests, gloves, scarves, and hats are often kitted while blankets, shoes, socks, shawls, and decorative pieces (like doilies) are often crocheted. However, as we said, these items can be either knitted or crocheted, given your preference of method or the way you want them to look. Have you knitted or crocheted? Which do you like better? This entry was posted in General Information and tagged crafts, yarn.